The Low profile design (1.85 inches) provides high stability and easy wheelchair access. The 31.5" x 47.25" weighing platform and scale access ramp will accommodate over-sized wheelchairs and geriatric (recliner) chairs. 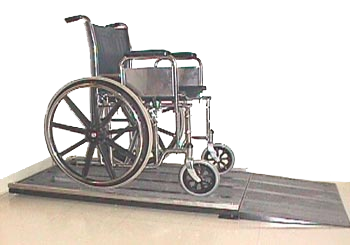 Because this scale was designed for wheelchair patient weighing, it features a floor-hugging, non-skid ramp. 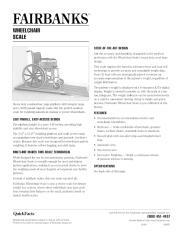 While designed for use by non-ambulatory patients, Fairbanks' Wheelchair Scale is versatile enough for most ambulatory patient applications, making it an economical choice to meet the weighing needs of most hospital or long-term care facility patients. Instead of multiple scales, this one scale can do it all.